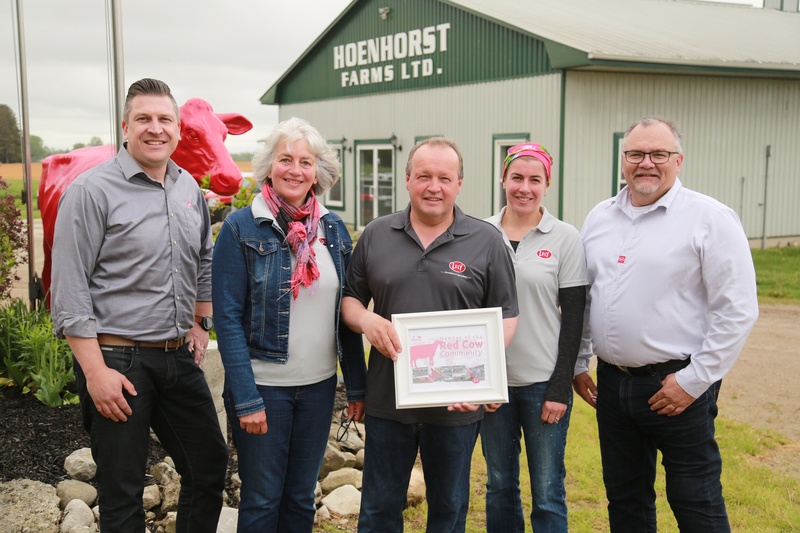 Lely North America with Lely Center Woodstock recently presented a red cow to the Wensink family and team members at Hoenhorst Farms, Ltd. after their transition from six Lely Astronaut A3 automatic milking systems to eight Lely Astronaut A4 robots. Lely recognizes Dairy XL operations that have eight Lely robots or more by presenting them with a “red” Lely cow to display on their farm. The cow signifies their entrance into the red cow community. Hoenhorst Farms, Ltd. began in east Holland when Gerrit Wensink’s grandfather bought a farm called the Hoenhorst in 1929. It was Gerrit and his wife Margriet who made the decision to move their family and their dairy operation to Canada in 1994, where they started milking 63 cows in August of 1995. As they continued to grow their operation, the Wensinks observed their labour costs were rising. In 2007, Hoenhorst Farms was up to nine employees milking 260 cows three times a day in a parlour. The milking would start at 4 a.m. and the last person would leave the farm at midnight. It was during this time that the Wensinks began looking at the future of dairy farming and the opportunities Lely robots afforded them. “Now we are doing chores between 6 a.m. and 6 p.m., and that is a big deal if you can run a dairy operation of this size within those hours,” Gerrit Wensink said. Today they are milking 340 cows at Hoenhorst Farms Ltd. and another 120 cows at a second farm — Braemar Farms — located just around the corner, which is run by Gerrit, his daughter Cox and a team of four full-time and three part-time employees. Gerrit’s wife Margriet also hosts six-course dinners on their farm for people who are not familiar with dairy farming so they get an up-close and personal look at how Lely robots work and have the chance to ask questions. They usually serve 8-10 people at a dinner. Gerrit serves all the food and beverages and Margriet prepares all the food from scratch. If anyone is in the area and is interested in the dinner and tour at Hoenhorst Farms Ltd., please send an email to Margriet two weeks in advance at wensink@oxford.net. Learn more about other Dairy XL operations and the Lely red cow community at https://www.lely.com/solutions/dairy-xl/ or at www.lelycenterwoodstock.com.